Breast cancer screening refers to the process of looking for breast cancer before a woman presents with symptoms. This facilitates early detection and timely treatment. If abnormal tissue or cancerous growth are detected early, it can become easier to treat. The disadvantage of not screening is that by the time symptoms are usually seen or felt, the cancer may have already progressed to an advanced stage/spread to nearby areas. 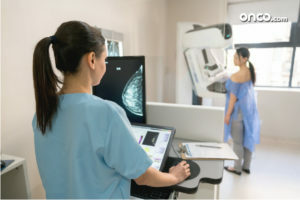 Breast cancer screening methods have begun to evolve, as scientists are trying to develop a better understanding of the genetic profile of women who are more susceptible to present with symptoms at a later stage than early. Researchers are also in the process of studying different consumption and lifestyle behaviors to figure out if these contribute to cancer risk, and if a certain risk category of women should be screened earlier, or to establish screening frequencies best suited for different women. What is the difference between breast cancer screening and breast cancer diagnosis? Please note, that when a doctor recommends you to get screened, they do not necessarily think that you have breast cancer. Screening tests (including routine screening mammograms) are generally administered in the absence of symptoms and after a particular age. When screening tests yield abnormal results, further testing becomes necessary in order to probe better and confirm the presence of cancer – those are called diagnostic tests (biopsies, other imaging modalities etc). How is breast cancer screened? There are two established scientific methods of breast cancer screening – mammography and breast MRIs. Mammography refers to the process of creating a mammogram, or an X-ray image of the breasts. It can be used to check for breast cancer in women who have no signs or symptoms of the disease. It can also be used if someone presents with a lump or any other sign of breast cancer. Mammography is recommended for women at both standard and high risk for breast cancer. Magnetic resonance imaging (MRI) of the breast uses a powerful magnetic field, radio waves, and a computer that can produce detailed pictures of the internal structures within the breast. It is used as a supplemental breast screening tool along with mammography. It can be used to screen women who are considered to be at high risk for breast cancer, or in dense breast, or to further examine abnormalities observed during routine mammography. How frequently should one get screened for breast cancer? Most medical organizations, government advisory panels, breast cancer advocacy groups and cancer research organizations such as the National Cancer Institute, American Cancer Society, Breast Cancer Foundation, NHS (United Kingdom), and American Institute of Cancer Research urge older women to undergo regular (annual or biannual) screening to detect breast cancer early. According to the NCCN (National Comprehensive Cancer Network), which is an alliance of the most advanced cancer care centers, all women above the age of 40 should go for annual screenings (mammograms). After a woman has attained the age of 55, they should either continue annual mammograms, or switch to one mammography test every two years. Women aged above 75 have the option of discontinuing annual/biannual mammograms at their own discretion. It is also recommended that women who have been identified to be at higher risk for breast cancer, owing to either genetic predisposition or sporadic factors, should start screening as early as the age of 30. This includes women with a known breast cancer gene mutation, or those with a first degree relative who has inherited a breast cancer gene mutation.